TORONTO, April 10, 2015 /CNW/ - Today, RioCan announced the launch of its Red Dot Safe Spot campaign, declaring all of its malls 'bully-free zones'. To support its anti-bullying efforts and create safe shopping environments for local communities, RioCan has partnered with Leave Out Violence (LOVE), a national charity committed to reducing youth violence, putting a spotlight on this debilitating social issue. RioCan has also partnered with Degrassi who represents the cause in an authentic way, having been a platform to promote self-confidence and acceptance for the past 14 years. Cast members of Degrassi are featured in a new 30-second PSA, which will be aired on Canadian television networks. "We are proud to be the only real estate corporation in Canada to be taking a stand against bullying and committing to making our shopping centres safer for Canadian youth," says Lyle Goodis, vice president of marketing at RioCan. "Whenever you visit one of our 40 malls across Canada – and you see the red dot on mall signage and at entrances – you can be assured that bullying is not tolerated there." Guest services is the Red Dot Safe Spot hub at RioCan enclosed shopping centres, where shoppers can go to report any form of bullying or to get help. To support anti-bullying beyond its shopping centres, RioCan has also created a new online resource (www.reddotsafespot.com) which provides a national directory for bullying support in local communities across Canada. With support from LOVE, reddotsafespot.ca helps victims of bullying or those affected by bullying find information about where to go in their local community and get the support they need. "At LOVE we understand that being bullied can be a lonely experience," says Lana Feinstein, executive director of Leave Out Violence. "But you are not alone. By keeping the conversation going and helping people understand the causes, consequence and solutions to bullying, we can create positive change. That's why we are thrilled to be partnering with RioCan to provide a resource to victims of bullying and help youth challenged by violence become leaders of violence prevention." 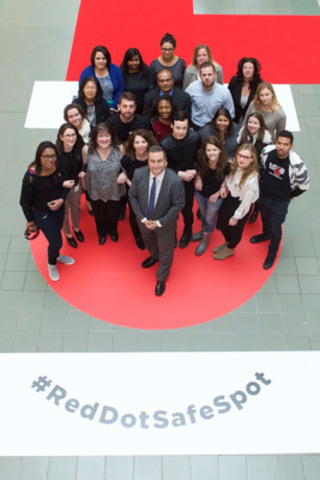 To officially launch the Red Dot Safe Spot campaign, RioCan is hosting three public events at Lawrence Square and Yonge Eglinton Centre in Toronto and Georgian Mall in Barrie. The kick-off event at Lawrence Square unveiled the new 30-second PSA and featured a panel of speakers including the cast of Degrassi, LOVE and Psychologist Sara Dimerman who discussed ways to reduce violence and bullying among youth. "I'm honoured to be a part of this important initiative," says Sara Waisglass, the actor who plays Degrassi's 'Frankie'. "We need to stand up against bullying and give it a voice – something Degrassi's been doing for over 35 years. It's an issue we can all relate to, like our characters do on-screen and as we do as regular teenagers off-screen in our daily lives." For more information about Red Dot Safe Spot, to learn more about the upcoming events or to find out what help is available in your local community, visit: www.reddotsafespot.com. RioCan encourages Canadians to join the conversation using #RedDotSafeSpot and together help create safer communities across Canada. RioCan Real Estate is the largest real estate company in Canada with ownership of 340 retail properties throughout North America. RioCan believes in its local communities since the community is ultimately their customer. As part of the community RioCan is committed to ensuring they are there for their customers and doing their best to be a safe hub for their neighbours. Toronto-based Epitome Pictures has produced award-winning youth and family drama for more than 35 years. Its flagship programs, including The Kids Of Degrassi Street, Degrassi Junior High, Degrassi High, and the current series, Degrassi: The Next Generation, now known simply as Degrassi, have been honoured with multiple Gemini Awards, Teen Choice Awards, the Television Critics Association Award, The Peabody Award, two International Emmy© Awards and three Primetime Emmy© nominations. Past Epitome series include The L.A. Complex, Instant Star, Riverdale, and Liberty Street. In August 2014, Epitome recently completed production on a new family mystery series, entitled Open Heart, slated for international broadcast in 2015. Epitome Pictures is part of DHX Media Ltd. (TSX: DHX.A, DHX.B).